​Hopefully, many of you got out to your local IMAX theater this evening to catch a sneak preview of Marvel Studios’ upcoming Guardians of the Galaxy, written and directed by James Gunn, and starring Chris Pratt, Zoe Saldana, Dave Bautista, the voices of Vin Diesel and Bradley Cooper, Lee Pace, Michael Rooker and more. For those who don’t have a local IMAX theater nearby or just couldn’t make it, SuperHeroHype got out to the IMAX preview at the Lincoln Square IMAX in New York City to get a better taste of what to expect from the movie when it’s released August 1. We’re going to put a spoiler warning in here in case you want to save any knowledge of what we saw until you see the full movie for yourself, and though we do give some details of the scene shown, we’re not going to give you all the dialogue or ruin all the jokes – there were a lot! When Chris Pratt’s Peter Quill sees one of the guards playing with his Walkman and headphones, we get an extension of the scene we’ve already seen a number of times with Quill getting stuck a few extra times with the electric prod while specifically referencing Blue Swede’s “Hooked on a Feeling,” which is playing through the headphones and becomes the soundtrack for the next few minutes, as we watch Quill being hosed down with a red liquid and being corralled into a cell by a bunch of flying robot drones. He’s soon joined by a soggy Rocket sans pants, who doesn’t have a lot to say… for once. Quill notices that he has cybernetic implants in his back. We see Groot in the background getting Rocket a battery from the guard station, stretching his limbs and trying to get it out of the wall – a bit of visual comedy that’s fun to watch taking place while Rocket and the others are talking in the foreground. When Groot pulls it loose, Rocket is explaining that they need to get the battery last but it’s too late and Groot’s activities have set off the prison’s alarms. 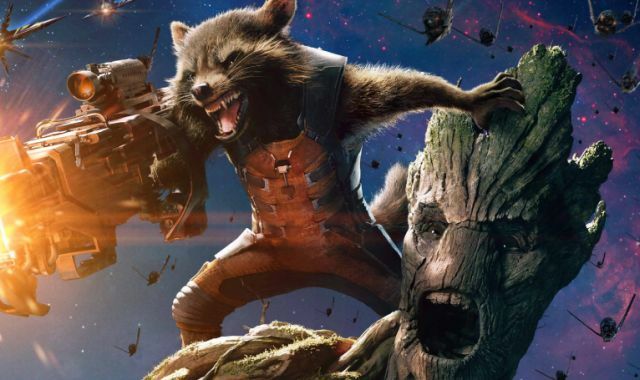 Dozens of guards come out baring guns as well as more flying robot drones, this time sporting rapid-fire guns that start shooting at Groot, who grows in size, sprouts small branches and proclaims loudly, “I AM GROOT!” as they start attacking. We get to see more of what Groot can do including turning his branch-like arms into a shield and he’s soon joined by Rocket who grabs an automatic rifle and climbs on Groot’s shoulders as they take on all comers. Up on the upper walkway of the prison, Gamora takes on half a dozen guards, taking them out quite effortlessly using her moves before getting her hands on the electric prod of one of the guards, which Rocket said he needed. At this point, all of them have joined in the fight against the guards including Quill, who grabs his own gun. Up until this point, we haven’t really seen or heard much from Dave Bautista’s green and red-skinned warrior Drax, but as Peter climbs up the guard tower, a drone comes up behind him and Drax jumps in the air and crushes the drone as he comes back down to earth. He then takes on a number of guards using enhanced wrestling moves. Drax follows the others up to the guard tower explaining that he’s sticking with Gamora until he finds the one responsible for their predicament. Dave Bautista’s speech as Drax is a bit harder to get used to as his dialogue is very simple, almost like what some might expect from the Lone Ranger’s sidekick Tonto, but he seems pretty badass when in action. Once they’ve all convened in the guard’s tower–Groot having sent the guard manning the tower flying out of there–Rocket starts working on his plans as more guards show up, this time sporting rocket launchers which they start firing at the tower glass. Rocket finally pulls a lever and we see that he has turned off the prison station’s artificial gravity everywhere except in the tower itself so the guards start floating upwards and the robot drones attach themselves to the top of the guard tower, which separates from the base and starts flying out of the Kyln through the spaceport above. That was a really impressive extended sequence that not only showed the humor of the movie but also showed what level of action to expect, since it was a pretty impressive setpiece that showed off everyone’s powers. After that, they showed an extended version of the brand-new longer trailer which just dropped earlier this evening and you can see right here (but since I already wrote it up, you can feel free to read on if you don’t have video capability). In our version, we see Groot peering at Star-Lord’s Walkman and pressing play on his “Awesome Mix Tape” to play the Runaway’s “Cherry Bomb” which runs through the trailer. We see Peter Quill giving a speech to the others trying to convince them to join together to fight evil in the galaxy, which is questioned by Rocket (just like everything else that comes out of Quill’s mouth). 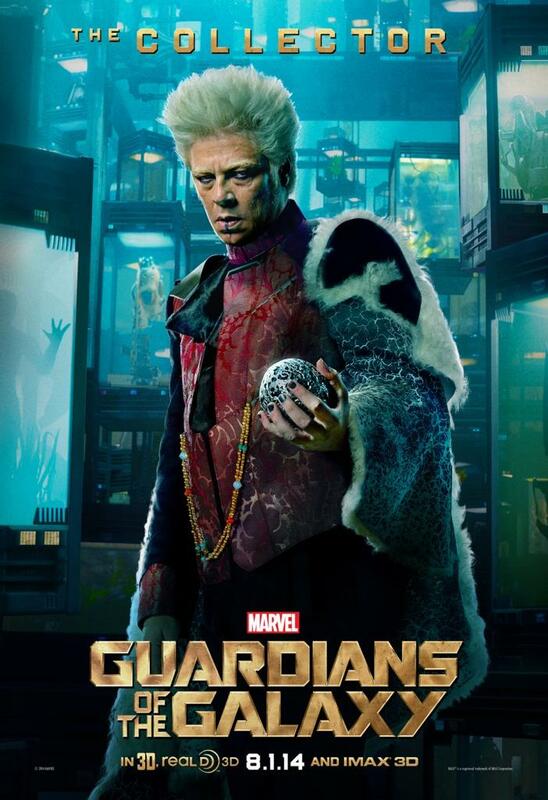 There was a lot of fast-paced footage that showed more of the Milano, Lee Pace’s Ronan and a brief glimpse of Benicio Del Toro’s The Collector (in the same environment as he was at the end of Thor: The Dark World), and another shot of Rocket shooting a machine gun while sitting on Groot’s shoulder. The point was also driven home that this was from the studio that brought us Iron Man, Thor, Captain America and The Avengers… as if no one attending the preview didn’t already know that, saying that it “Brings You A Team So Good… It’s Criminal.” They also showed the entire after-credit banter between Quill and Rocket about the former having a plan, though the footage we saw was extended with Rocket arguing that Quill only is saying he had a plan, mimicking what Rocket said earlier and he doesn’t believe that he has a plan. 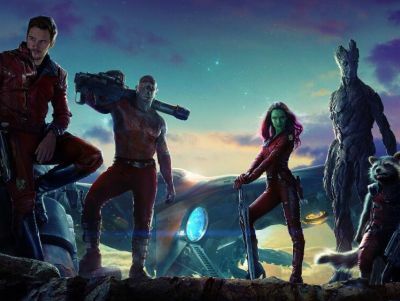 Anyone still concerned that this odd group of lesser-known Marvel outer space characters might not connect with audiences really needed to see this footage, because I honestly don’t think anyone who watched the preview won’t immediately turn around and buy advance tickets for an IMAX 3D screening for opening weekend. In the meantime, check back tomorrow for Spencer Perry’s extra-special report from the London set of Guardians of the Galaxy. August 1 can’t come fast enough!